BIOMASS, BIOENERGY AND RENEWABLE CHEMISTRY « Global Market Insights, Inc.
Over the recent years, lignin market has been traversing along a lucrative growth path owing to the rapid technological progressions in bioenergy and biofuel domains. Moreover, the rising environmental concerns pertaining to the worldwide increase in air pollution has favorably influenced the revenue share of the overall lignin industry. Apparently, the potential environmental benefits from finding alternative uses of lignin are humongous. Lignin can be used to substitute fossil based raw materials over an extensive range of products, from carbon fibers to plastics and individual chemical products. Furthermore, the demand for value-added products has been on the rise lately – a factor that would provide an additional economic incentive to the global lignin market stakeholders. Elaborating further, it would be prudent to mention that numerous research projects have been undertaken by various lignin industry participants and universities to explore the commercial potential of lignin. Citing an instance of the same, Nordic Innovation Centre, ScanBalt Campus Knowledge Network Environmental Biotechnology, and a host of universities of Sweden had initiated a joint industry-academy project, named as LigniMatch, to address environmental challenges and study the economic prospects of lignin. The ambitious project aimed at finding a basis for efficient upgradation of the lignin fraction from paper and pulp industry into commercially viable products that can replace fossil-based alternatives. Apparently, the project identified a wide range of probable lignin-derived products such as activated carbon, binders, phenol, carbon fibers, sorbents, plastic materials, and motor fuel. Moreover, the project laid out a roadmap to guide lignin industry players on how to successfully incorporate the emerging technologies in order to develop advanced lignin-based products in the Nordic region. Concurrently, the aforementioned instance goes on to demonstrate the significance of lignin, given that it could prove to be of immense help to conserve the ecological balance. 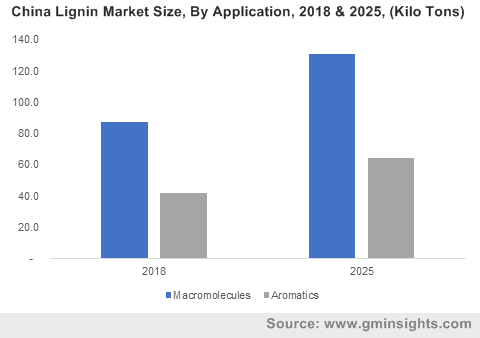 Apparently, owing to the innumerable applications of lignin across various business domains, the global lignin market is bound to flourish in the ensuing years. Speaking of the geographical growth outlook, lignin has found massive usage in European nations as a colorant in diverse industrial applications such as textile processing, printing inks, food processing, and wood stain. Moreover, the rising consumer awareness has led to an increased demand for bio-based products in this region which has subsequently boosted the overall Europe lignin market expansion in the recent times. In addition to this, European Union has been proactive in enforcing strict regulations such as REACH (namely the registration, evaluation, authorization and restriction of chemicals) which aims to constrain the transportation of synthetically driven chemicals. Furthermore, it has been observed that dust collectors have gained prominence in this region, given that these systems lower the ill-effects of air pollutants. Apparently, the presence of robust regulatory framework and the rising popularity of lignin derived products is certain to propel the fortunes of this business space. In fact, as per a report by Global Market Insights, Inc., the Europe lignin market, majorly driven by France, Italy, UK, and Poland, is anticipated to surpass an impressive remuneration portfolio of USD 350 million by 2024. It is quite imperative to mention that crucial market participants including Domsjo Fabriker AB, Nippon Paper Industries, Ingevity, Domtar Corporation, Borregaard LignoTech, Burgo Group Spa, and Liquid Lignin Company have been focusing on developing new methodologies to ensure optimal production of lignin in terms of effectiveness and cost-efficiency. Add to it, the abundance of raw materials and rapid adoption of new technologies has favorably influenced the overall lignin industry share which is expected to exceed USD 960 million by 2024, as per reliable estimates. This entry was posted in BIOMASS, BIOENERGY AND RENEWABLE CHEMISTRY and tagged Global Lignin Market, Kraft Lignin Market, Lignin Downstream Potential, Lignin Industry, Lignin Industry Analysis, Lignin Market Analysis, Lignin Market forecast, Lignin Market growth, Lignin Market outlook, Lignin Market pdf, Lignin Market Price, Lignin Market Report, Lignin Market Research, Lignin Market share, Lignin Market size, Lignin Market Size By Product, Lignin Market statistics, Lignin Market Study, Lignin Market trends, Lignin Market Value, Lignin World Market, Lignosulphonates, Low Purity Lignin. The need for environmental sustainability has been realized taking into consideration the rapidly increasing population, which may cross the 7 billion mark by 2050. Owing to the rising health and environmental concerns, there has been a huge demand for proper waste disposal and use of bio-degradable substances which in turn has driven the growth of Biodegradable Superabsorbent Materials in the polymer industry. The market has seen a commendable surge in all these years, driven by its ease of use, hygiene, cost-effectiveness and environment friendly characteristics. The popularity of conventional materials is being surpassed by the use of these biodegradable products. Biodegradable Superabsorbent Polymers are used for high absorption of water and aqueous solutions relative to their own mass primarily for use in the form of diapers, adult incontinence products, feminine hygiene products, and similar applications. According to a research conducted by Global Market Insights Inc., biodegradable superabsorbent materials market size is forecast to be worth USD 192.6 million by 2023 with a CAGR of 6.1%. Disposable diapers application segment dominated the market in 2015, having had a market share of USD 79 million. The growth is attributed to the better living standards and hygiene concerns. Agricultural application is expected to witness a CAGR of more than 7% from 2016-2023. Also, medical issues related to bones and joints are boosting the adoption of cellulose hydrogel biodegradable polymers due to its effective healing properties. Medical application segment shall see a significant growth and is expected to be worth more than USD 5 million by 2023. Biodegradable superabsorbent materials product segment comprises of Polyvinyl Alcohol (PVA), Polysaccharides, Polyitaconic acid, and Polypeptide. Polyvinyl Alcohol (PVA) which was valued at approx. USD 82 million in 2015, dominates the product market with its major application in feminine hygiene and adult incontinence products. Besides, Polysaccharides which is abundantly available in the form of starch, chitin, natural gums and sugar is expected to witness the maximum rise at a CAGR of 9% from 2016-2023. Biodegradable superabsorbent materials are being adopted worldwide. Europe market, led by Germany, dominated the industry by contributing a share of USD 48 million in 2015. APAC is expected to witness the highest growth, registering a CAGR of 6.5% over the period of 2016-2023 with China market share to be worth USD 25 million by 2023. U.S. adult incontinence market is expected to grow at a CAGR of 5.8% reaching 2.1 Kilotons by 2023. Some of the key players in this market space are ADM, TryEco, Exotech Bio Solutions, Weyerhaeuser Company, Valagro, NanoChem Solutions, AMEREQ, CryoLife, Coloplast A/S, Collagen Solutions, and Akron Biotech. 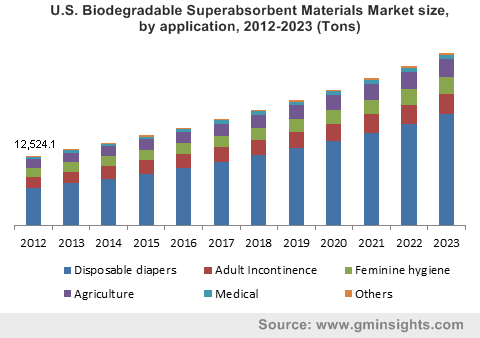 The research by Global Market Insights Inc. anticipates the Global Biodegradable Superabsorbent material market to reach 89.6 kilotons in 2023. This huge demand and the resulting growth shall witness a number of collaborations, alliances and partnerships in the corporate world. The Biotech firms may tie up with the technology world to enhance their product portfolios. This entry was posted in BIOMASS, BIOENERGY AND RENEWABLE CHEMISTRY and tagged Application Potential, Biodegradable Superabsorbent Materials Market Size By Product, By Application, Competitive Market Share & Forecast, ndustry Analysis Report, Price Trend, Regional Outlook (U.S.. Waste to energy is the process of producing energy in the form of electricity or it is known as the form or energy recovery. As per the Industry Analysis, Waste to Energy (WTE) Market in the year 2015 valued at USD $20 billion and is projected to grow at over 6% CAGR till the year 2023. The regional analysis market is led by European market with leading markets in France, UK and Germany. This market is anticipated to grow moderately and record revenue of USD $15.5 billion by year 2023. Asia Pacific market is growing led by Japan and China recording soaring gains at over 6.8% CAGR by the year 2023, developing energy through substitute resources like landfiling which is the MSW (municipal solid waste) disposal techniques; it is likely to become popular in the Asia Pacific market. The report features comprehensive analysis of the market with key market trends and key factors influencing the market listed in the report. Thermal waste to energy process dominated the segment and is predicted to exhibit moderate gains over the projected time frame. The alternative thermal processes are anticipated to foresee surge in demand. Biological waste to energy technology is poised to register high growth at over 6.5% during the forecast period. Anaerobic digestion penetration into developed composting plants is projected to further market growth. As per the latest news published on 01st June’16 about the Waste to Energy in the USA, the 70 mass burn plants in the United States consume 13% of annual waste; this is 14.5% as compared to year 1990. Approximately, 2.1 billion tons of waste is generated by humans annually, which is then carried to landfills and it decomposes and is converted into energy. In the United States, around 245 million tons of waste is produced annually. As per the United States Environmental Protection Agencies inventory, the municipal solid waste released 1% of highly toxic contents in the year 2000 as compared to 13 years prior. Furthermore, as per latest news published on 26th May’16 of International Journal of Epidemiology, it is reported that people living near landfills are exposed to health hazards. Humans who stay 5 kilometers near the landfill site have diagnosed diseases like lung cancer, respiratory diseases, hospitalizations and even deaths. The waste throws out hydrogen sulphide which is harmful for humans especially children. Fairly competitive players run the waste to energy market share, like Hitachi Zosen, Covanta, Keppel Seghers and Wheelabrator Technologies are prominent. Some companies are part of the value chain that work on operate and built or only transfer basis, or some run the plant operation. Foster Wheeler, China Everbright International, Plasco Energy, Veolia Environment, Xcel Energy are some of them. This entry was posted in BIOMASS, BIOENERGY AND RENEWABLE CHEMISTRY and tagged Waste Management, Waste to Energy, Waste to Energy (WTE) Market Size, Waste to Energy Market, Waste to Energy Market Size, WTE. Global market Insights has announced release of new study based report on PMMA (Polymethyl Methacrylate). According to the report projected for period of 2015-2022, PMMA market size is forecast to surpass 3.1 million tons, at a growing CAGR of more than 6.3% by 2022. Growing expenditures in marketing and advertising campaigns is projected to fuel market growth during the expected time frame. The latest industry research report scrutinizes the PMMA market by different segments including regions, applications, companies, etc. over the projected time frame of seven years. This report provides a comprehensive overview of the PMMA industry comprising definitions, classifications, and market players in the industry chain structure. The qualitative and quantitative is offered for the market considering key development trends, competitive landscape, and crucial factors prevailing in the synthetic &Bio PMMA market. The research report scrutinizes the global synthetic &Bio PMMA industry from 360 degree perception, taking manifold facets into consideration including segmentation, key developments, market overview, market growth and dynamics, market trends and future outlook, market opportunities, potential investment segment, competitive landscape etc. Global bio PMMA market will witness higher growth rates and exceed 530 kilo tons by 2022 during the estimated time frame. PMMA market price trend is likely to prove a vital factor in market penetration for bio-based alternatives. Global advertising expenditure is anticipated to surpass USD 670 billion by 2022. Increasing demand for low emission, light-weight and fuel efficient vehicles is projected to boost growth. Rising demand for LED flat panel display TVs, growth in sign and display segment, growing application scope in healthcare sectors are expected to impact the market growth positively. Fluctuating prices of raw materials are forecast to hamper PMMA market growth. Strict government rules and regulations to limit GNG emissions and control dependence upon reducing fossil fuels are anticipated to support bio based PMMA market growth. Rising investments in order to develop this technology is poised to open new growth avenues. Construction was accounted as the major application segment is anticipated to experience moderate growth at over 6.2% in the near future. Asia Pacific dominated the revenue generation segment and is expected to witness substantial growth and hit USD 1.35 billion, owing to low production cost, cheap labor wages and large consumer base in China and India. Europe market is projected to experience below average growth rates up to 2022 owing to recent Euro crisis. Key market players in the industry include Arkema (Atluglas International), Mitsubishi Rayon, Chi Mei Corp and Sumitomo Chemicals, LG MMA, Dow Chemical, Asahi Kasei, Kuraray and Polycasa. This entry was posted in BIOMASS, BIOENERGY AND RENEWABLE CHEMISTRY and tagged Bio PMMA, Bio-based PMMA, PMMA, Polymethyl Methacrylate, Polymethyl Methacrylate Market, Polymethyl Methacrylate Market size, Synthetic & Bio PMMA, Synthetic PMMA. It is predicted that biofertilizers Market share will touch USD 1.66 billion till 2022 which is rising at a Compound Annual Growth Rate (CAGR) of 13.2% during the years from 2015 to 2022. This exponential growth of market is because of customers’ awareness towards fitness and wellness, bad effect of inorganic material and the rise in price of chemicals. There is a boom of organic food as its farming is popular in more than 160 countries across the world. In 2014, market of organic food reached USD 88.06 million and its growth is projected to touch USD 304.99 million till 2022, and its CAGR will remain 17.3% between years 2015 to 2022. Chemical fertilizers are widely used for increasing the productivity of plants, but they are responsible for pollution of underground water; these fertilizers also get stored in plants which becomes hazardous. These adverse effects of chemicals have enhanced biofertilizers market trends because of their eco-friendly nature. Nitrogen fixing biofertilizers are gaining huge publicity in the market and have noticed 75% of share in revenue in the year 2014. Increasing demand of nitrogen fixation for consuming nutritious compounds like nucleic acid, chlorophylls will give a significant boost to this industry. Apart from this, these fertilizers reduce dependency on the products of petroleum and minimize emission of carbon in the environment, thereby giving one more reason to use them. Phosphate solubilizers are the second highest product and are anticipated to grow at the rate of 13% till 2022. Bacillus, pseudomonas along with aspergillums is commonly used bacteria which cater phosphorus to plants. With the adoption of organic nutrients, demand of phosphorus solubilizers is going to increase in near future. It is the global reach of biofertilizers which has made North America a foremost region contributing around 30% of the overall share in 2014. Positive attitude of U.S. and Canada towards organic materials in agriculture has given an upsurge to North America. Countries like India and China are predicted to enjoy a decent CAGR of 13.5% till 2022. Agricultural growth in India, Pakistan, Indonesia, and China along with Malaysia is likely to include latest technologies for fuelling up the demand of these organic products. Talking about the companies dealing with these products, Novozymes A/S along with CBF China Biofertilizers AG are the top leading firms delivering their materials to Europe as well as North America. Companies working with these products take help from resellers, contractors and distributors for exporting them, but there are firms who follow an integrated process thereby working with own resellers and distributors. This entry was posted in BIOMASS, BIOENERGY AND RENEWABLE CHEMISTRY and tagged Biofertilizers, Biofertilizers Market, Biofertilizers Market size, Nitrogen Fixing, Phosphate Solubilizing, Seed Treatment, Soil Treatment. Global Market Insights Inc. has announced an addition of a new research based report on farnesene market. The market size is estimated to upsurge at a growing CAGR of 27% by 2023 according to the report. The professional and high quality report features in-depth market analysis on the global Farnesene industry. It initially provides an outlook of industry with the basic information such as definitions, application, classification, and technology etc. Moreover, it explores global market on the basis of application, products, region and competitive landscape. The report also lists key company profiles, market share, business strategies, financial metrics, forecast and estimations in terms of volume and value, coupled with key aspects that influence the market including impediments, challenges, opportunities and drivers, etc. Increase in global biofuel production and usage owing to increased usage in automobiles and aviation sector to reduce carbon dioxide emissions is expected to have appositive impact on the market growth during the forecast period. Performance material applications are poised to experience significant growth over 40% CAGR by 2023. Increasing use of ingredients derived through biotechnological route or from vegetable oil rather than animal sources is likely to drive market growth. Factors like use of alternative bio fuels, alteration in top feedstock harvest that is sugarcane are likely to hinder the market growth. Europe farnesene market size, with Germany, UK and France at dominating positions is likely to witness a substantial growth owing to use of sustainable product derived from biomass and implementation of environment measures to limit GHG emissions. Furthermore, the thriving European cosmetic industry is anticipated to impel industry demand. APAC region is projected to register surge in personal care and cosmetic industry with remarkable gains at a CAGR over 28% during the projected timeframe. Furthermore, increase in per-capita disposable expenditure capacity together with existence of several large scale manufacturing companies is anticipated to propel APAC demand in next few years. Latin America market is forecast to see strong gains during the projected time frame. Amyris dominate the global farnesene market share. It uses yeast to manufacture through biotechnology route. It has collaborated with Kuraray, Total, IFF to develop target molecule for relative applications including polymers, biojet fuels and fragrances. At present, Chromatin and Intrexon are in emerging stage for reaching commercial production level. This entry was posted in BIOMASS, BIOENERGY AND RENEWABLE CHEMISTRY and tagged Amyris, Cosmetics & Personal Care, farnesene amyris, farnesene applications, farnesene fuel, farnesene market share, Farnesene Market Size, farnesene production, Flavors & Fragrances, Fuels & Lubes, Performance Material.